We Care. We are Family. Pets are more than just animals. They are a snuggler on a rainy day. They are comforting in hard times. They are vacuum cleaners under the baby’s chair. They are companions when no one else is around. They are unconditional love. They are a best friend. They are family. Donna Chandler brings, nationally renowned Canine Trainer and Behaviorist, reveals her secrets right into your home for the most complete and convenient dog obedience course you will ever find. GOOD DOG! ONE-der Class© will be your number one go to resource for transforming you and your dog into happy and enjoyable relationship that will last a lifetime! Life is too short to not enjoy each others’ company and life is too hectic to commit to 6 weeks of training classes. Donna brings her groundbreaking course right into your living room for your entire family! Experience combined with proper accommodations, allow you to leave your pets in our care without concern. All dogs are provided with floor to ceiling indoor/outdoor runs, giving your pets the proper amount of space without feeling confined. We also boast an impressive amount of outdoor space for additional activity and fun during your pet’s stay. Whether its our 1/2 acre fenced in yard for Play Time or our 15 expansive acres for Nature Hikes, your dog is sure to find an activity that suits their style! Proper Grooming is vital to any healthy pet and at Arbor Lane, we understand it’s importance. With more than 50 years of combined experience, our groomers set out out to keep your pets healthy and looking good! Whether its a bath before going home after a boarding stay or a standing 6-week grooming appointment, we can accommodate your pet hygiene needs! Daycare has become extremely popular over the years due to busy schedules and the increase in pet ownership. We understand this need but also want to ensure your pet’s safety while in our care. For this, we offer private day-boarding with drop off as early as 7am and pick up as late as 6pm. Your dog still enjoys the excitement and company of other dogs without the worry of injury from pack-mentality interaction. Here are some common questions we hear. Can we come and tour? Will my pet get attention? Of course! There is regular interaction between our staff and your pet throughout the day. What is the Exercise Package? Exercise Package is one-on-one time in our large fenced-in quarter of an acre play yard. It is typically off-lead free time where your dog(s) can run, play or simply explore. With the Exercise Package, your dog(s) will get a session in the morning and afternoon each day. What is the cost to board my pet? We charge by the calendar day. Meaning, if you drop off today and pickup tomorrow, that would be counted as two days. Our daily rate varies throughout the year and the best way to check the cost of a reservation would be to click through a reservation online. You can play with different dates, rooms and add-on services to see what the cost will be. We do not mix dogs of different families together. So, if you choose Exercise Package, this is individual time that includes only your dog(s). We want to ensure your pet’s safety while in our care, and one way to do this is to not toss a bunch of dogs together in the same yard. Don’t worry, your dog will still get plenty of stimulation by seeing other dogs during their visit. Think of kennel cough as a canine cold, transmitted as human colds are transmitted — from an infected individual in close contact with another individual with compromised immunity. Like a cold, it is also considered a mild self-limiting condition. We have in place various safeguards against the spread of kennel cough, but just like your kids at school or yourself at work, it is always a possibility of picking something up when around a group of individuals. What do you do to prevent kennel cough? We’ve invested in full facility air cleaning units which are constantly scrubbing the air circulated through the kennel. Also, our building is setup in such a way that full air exchanges occur throughout the day. We also have in-line disinfection systems that constantly wash down all pet areas. Yes, the owners live right on the property. Also, the two managers at the Kennel both live only 1 mile away. Pet owners trust us to look after the needs of their beloved companions. 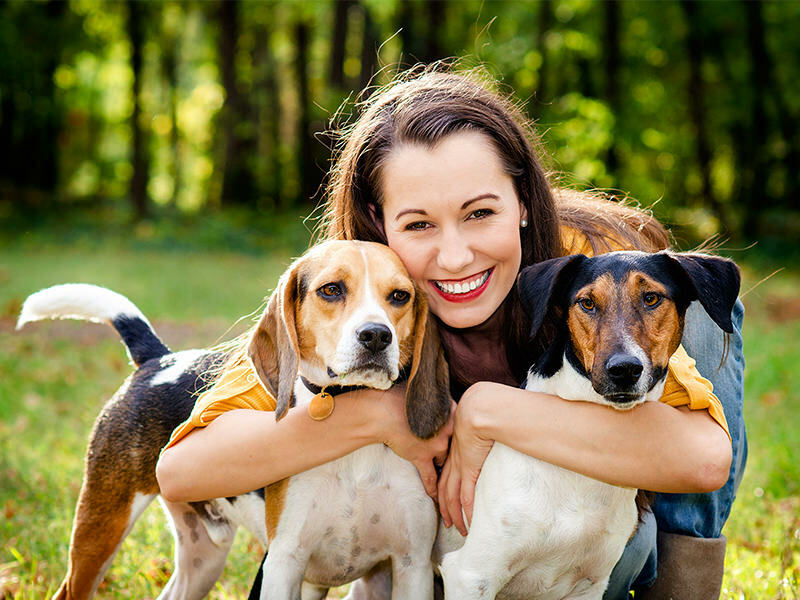 We are professionals committed to delivering the very highest of pet care and affection.